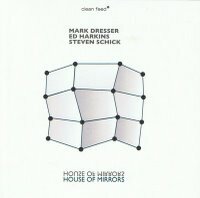 House of Mirrors is a remarkable project in collaborative music making. It began in 1999 when bassist Mark Dresser expressed interest in supplying tones to complex rhythmic materials developed experimentally by the composer and trumpeter Ed Harkins. Eventually what began long-distance between the Brooklyn-based Dresser and the Californian Harkins became a regular interaction in 2004 when Dresser joined Harkins on the faculty of University of California at San Diego. A year later percussionist Steven Schick, who has recorded the complete solo percussion music of Iannis Xenakis, made the group a trio. The work is some distance from Dresser’s more improvisatory projects, closer to contemporary chamber music, with much of the music through-composed by Harkins and Dresser with spontaneously formed connective tissue. The interest arises in the stunning complexity of Harkins’ rhythmic language, from its sudden accelerations to the endlessly unraveling meters and shifting accents, creating a relationship between rhythmic forms of serialism and certain aspects of African polyrhythms. The results are highly unpredictable, pitch and time fused into new, yet seemingly absolute, relationships. Given the level of mathematical complexity of this music, there’s a surprising range of moods, from the manic playfulness of “Floxy” to the odd hurry-up-and-wait of the delays and flurries of “Moa.” The 15-minute “Oscula” is particularly notable for the complexity of relationships that arise among the various instruments and the sometimes structuring roles of timbre and dynamics, the piece eventually evolving into near silence. Schick has commented that his first entry into the music was timbral rather than rhythmic and there’s plenty of that here, his percussion seemingly rubbing the resonance of trumpet and bass as much as it participates rhythmically. “Rebus,” with its whistles of cymbal and bass, contains wind sonorities that testify to Harkins’ own powers of invention. Investigating a new rhythmic language, the trio also expands its own sonic palette.